There are a number of reasons why your device may fail to communicate correctly. There is a basic diagnostics function within Settings > Remote Management > Diagnose connection issues which can provide you with the status of the connection to our servers and Firebase Cloud Messaging. As well as forcing another push messaging registration. Device is unable to reach our web server https://www.kbremote.net or https://kbremote.azure-mobile.net– try accessing these sites via the default browser on the device to troubleshoot. Your device has an invalid date, this causes the secure connection method to fail as the date may fall outside of the validity period of the certificate used on our website. You may receive the message “invalid/untrusted certificate”. Your network firewall is restricting communication to vital services. See our Ports and IP addresses documentation. Your device may switch off WiFi during sleep. 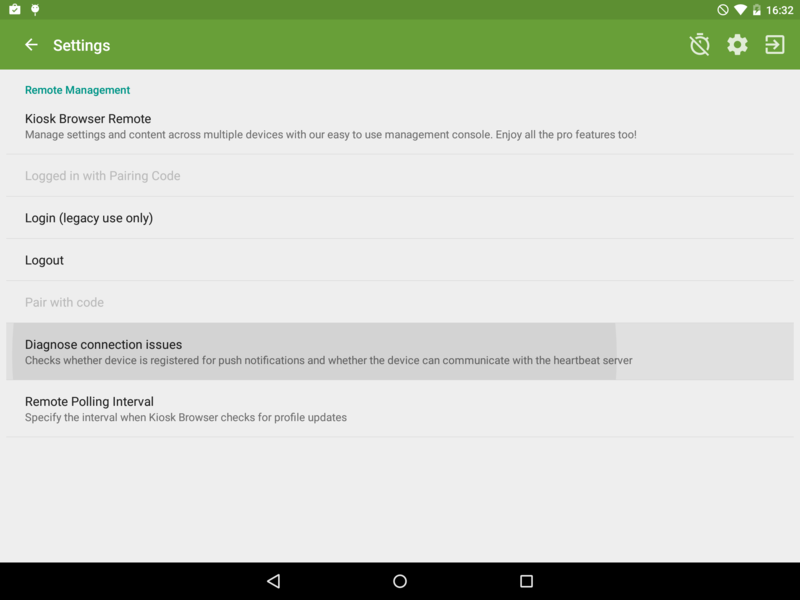 Some devices (example: Nexus 7 2012) fail to keep the WiFi connection active during sleep even when the sleep setting is to "Never" (Android Settings > WiFi > Advanced > Keep Wi-Fi on during sleep), there are some workarounds to this such as using this 3rd party widget, however we recommend you research the issue for the device you are using. If you have a restrictive network, more specifically your corporate firewall blocks most traffic you will need to look at our Ports and IP addresses documentation to ensure your firewall is allowing access to required services. Kiosk Browser will automatically attempt to register for push notifications on startup, so if you believe you have resolved the cause of the issue you can either restart the device or force stop Kiosk Browser from Android Settings > Apps > Kiosk Browser > Force Stop.